This is the story of a legacy that exists only in the memories of a few; of a craft which is not known to be practiced anymore, but remnants of which still survive in the lives of the people. 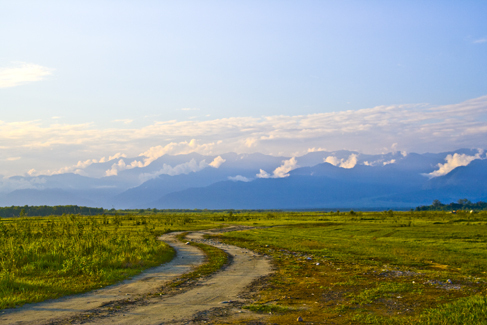 Arunachal Pradesh, the eastern most state of India, is a land of beautiful green hills of the lower Himalayas and is home to the Mishmis,among about 25 other tribes. A vast network of small rivers which are subsidiaries of Arunachal Pradesh (Lohit), one of the largest rivers in the world, gives this region an unmatched set of natural assets. These valleys were touched by humans some 8 centuries ago when the tribes of northern dry planes of Himalaya started migrating towards the green southern valleys, their languages and lifestyles evolved according to the paths they chose. These settlers were the Mishmis, who now have about 72 different clans. Mishmis, who live in long houses that stand on bamboo pillars, are one of the rare tribes for whom silver is more valuable than gold. Around the 16th Century, the Mishmis used to trade their yak leather, wool and tree fibre for silver and salt, among other things, at the Brahmaputra valley in Assam. Therefore, silver became a symbol of how well travelled one was and was highly prized for the status it gave its wearer. Mishmi silver ornaments are unique and fascinating. 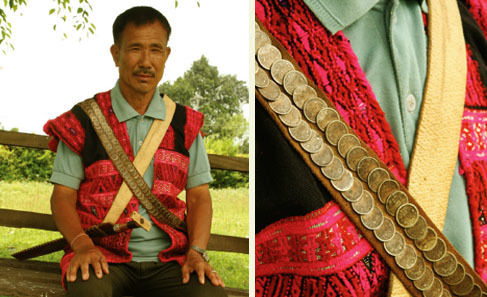 The men wear a strap across their chest, laden with silver coins that belong to the pre-independence currency. The coins were used for their ornamental value, and post independence; the small 25p coins replaced the rare silver ones. 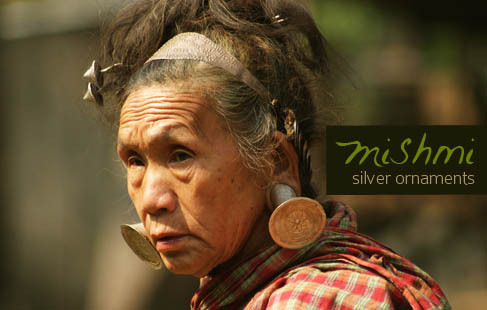 Mishmi women are also bedecked in silver, wearing a silver band over their heads, silver bodkins and a pair of dumbbell shaped earplugs, all of them finely embossed. These earplugs, known as Krupei, or Eingsut consist of two parts, a dumbbell and a cap. The dumbbell of Krupei is made of silver with dotted pattern embossed over the flat face. It is locked from behind using another embossed copper cap. Sometimes, the women have their ear-lobes slashed because of the weight of the ornaments, but this does not stop them from adorning themselves with this fascinating piece of jewellery and they wear it by attaching the ear plugs below the ear lobe with strings.Nowadays, younger women have stopped wearing the ear plugs and have moved on to modern earrings. The use of ornamental silver does not end at jewellery; a Mishmi is incomplete without his silver smoking pipe. This intricately ornamented three piece pipe consists of a cup and two or more additional tubes. 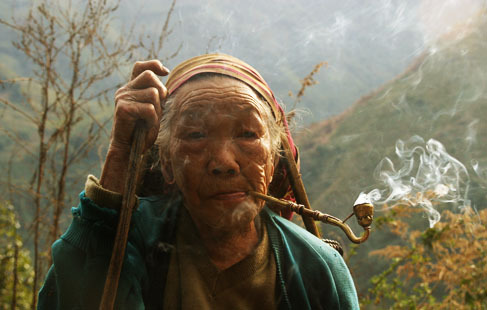 The length of silver pipe represents the seniority level and social status of a Mishmi man. Usually younger people fill up the pipe for older ones in meetings. Earlier, bamboo pipes were also used, although they are rare now. Earlier, the silver ornaments were made by traditional craftsmen by the technique of wax moulding. The Mishmi silver smith craft was much more intricate and artistic than the present day. Mishmi silver-smithing is now an obsolete craft; it is not practiced anymore. Now, the business of making silver ornaments has shifted to modern jewelers, who use the process of embossing on silver sheets. The designs are simple; traditional units like four leaf flower are embossed by compositions of dots and simple curves. Traditional Mishmi ornaments are worn only by the older people as the younger generation moves on to the variety of modern designs offered by the local jeweler. Today, the craft of Mishmi silver smithing is becoming a memory, the exceptional technique fading in the minds of the ones who practiced it.